To switch up our homify 360° daily discoveries ever so slightly, today’s highlight will not be exploring the insides of a house, but rather the exterior surfaces – specifically its front garden. 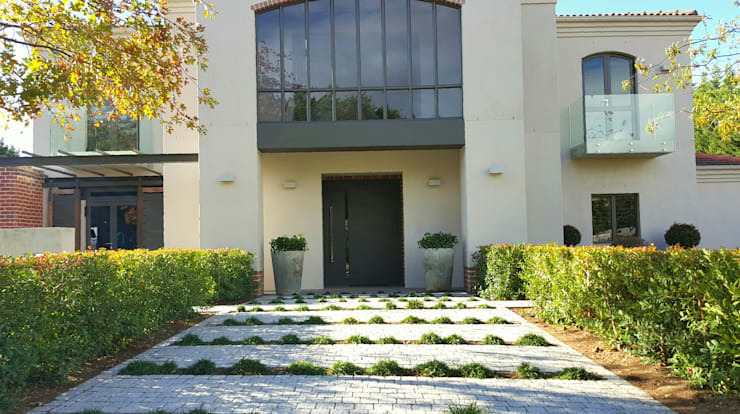 Yes, garden designs are what’s on today’s agenda, and professional landscape architects of Greenacres Cape Landscaping are going to show us what they are capable of, or rather what they conjured up for a striking exterior space for a modern home in Cape Town. Too often we forget that our homes’ exterior spaces go a long way in setting up first impressions – yes, how your house looks on the outside definitely plays a part in what guests might think of you. Fortunately, thanks to these landscape geniuses, this particular house has no qualms about a bad first impression. Not only is that front lawn neatly trimmed (a project that requires constant maintenance, by the way), but the additional touches of trees and shrubs look just as perfectly polished. 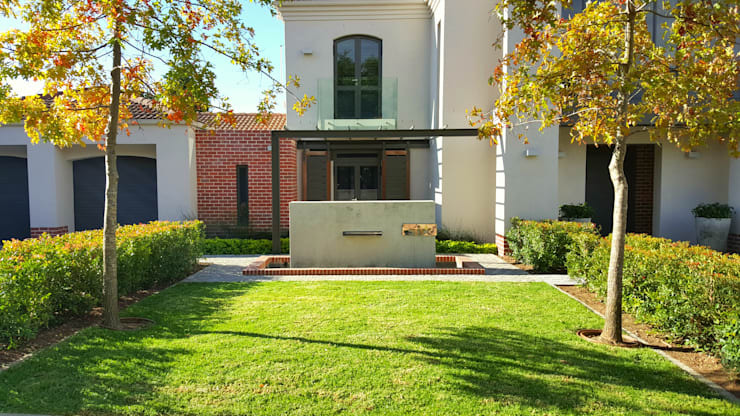 A neat little red-brick trim frames the main water feature in front of the house, which also sports the house number in a chrome design. And see how the red-brick touch neatly balances out the brick-clad wall in the background. As they say, the devil is in the detail! 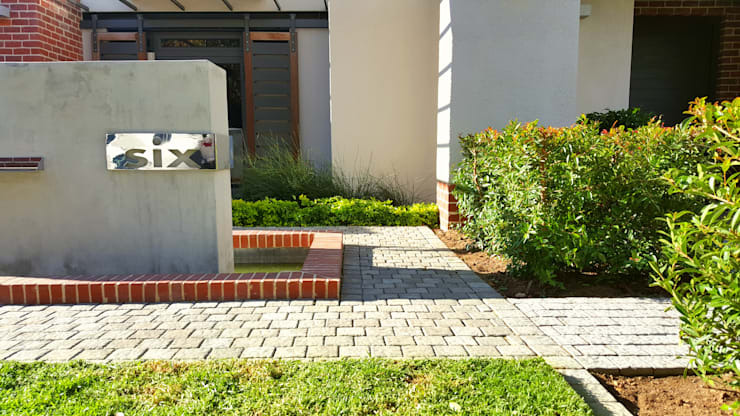 We just love how the path leading towards the front door has been styled up via bricks and little plant touches, ensuring the end result looks more like a runway than a garden path – especially with the neatly trimmed shrubs along the side! Even after the sun has set, this location still wants to place emphasis on the striking gardens – and why shouldn’t it, considering how beautiful it turned out? 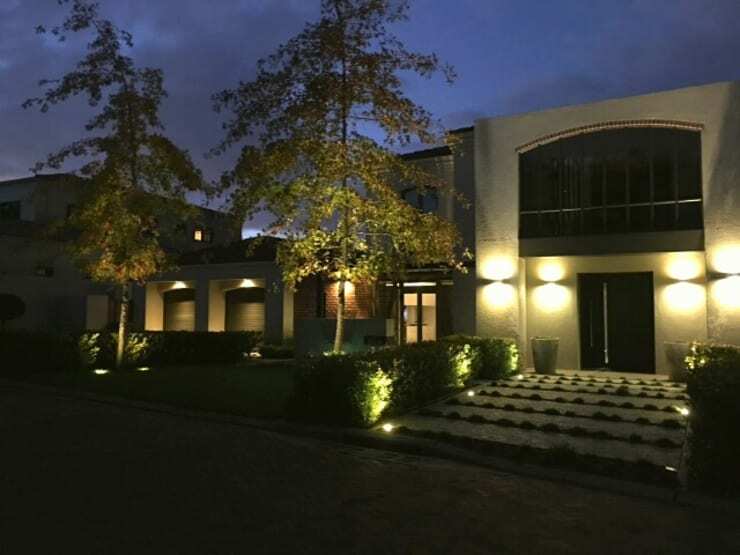 That’s why exterior lighting fixtures have been strategically placed throughout the garden to highlight the landscape designs which, of course, also goes a long way to style up the exterior look of the house at night. Definitely an inspiration on how important landscape architects can be for a house’s look! Want to have a go at those outside spaces yourself? Try these: Stunning DIY garden ideas that you can do in one weekend (no landscaping!). Would you consider this look for your garden/yard?